Pattern: NCAA Georgia Bulldogs. Genuine licensed merchandise. Machine washable. One queen size comforter 86 x 86 inches (218 cm x 218 cm). One queen flat bed sheet, finished size 90 x 102 inches (229 x 259 cm). One queen fitted bed sheet. Both sheets fit a standard queen mattress of 60 x 80 inches (152 x 203 cm) Two standard pillowcases (the white ones in the picture), each fit 20 x 26 inch (51 x 66 cm) pillows. Sheets are white. They do not have the team logo. 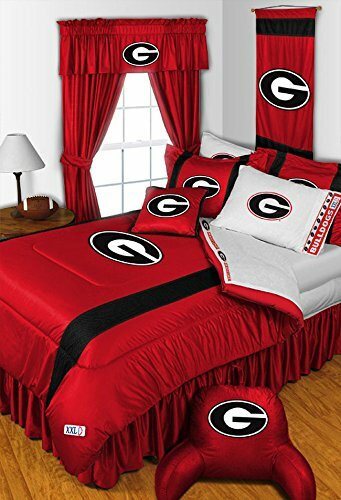 Only pillowcases and comforters have team logos. This sale is only for the items described. Other items pictured are for illustration only.